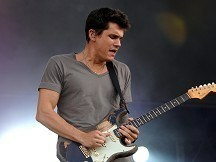 John Mayer has been forced to cancel a series of upcoming gigs after being diagnosed with a serious throat condition. The 33-year-old singer revealed on his blog he has cancelled his upcoming appearances with Tony Bennett in Los Angeles and at the iHeartRadio Music Festival in Las Vegas, and has had to delay production on his new album Born And Raised. John wrote: "After several months of going week to week monitoring and hoping to correct the condition, I am forced to cancel my upcoming singing engagements due to something next to my vocal cords called a granuloma. "I'm bummed to have to bow out. I know there were people depending on me to be there and I'm sorry that I can't be on those stages. "Born And Raised is complete as far as music recording, song selection, and in some cases mixing, but because of this condition I couldn't finish singing on several of the tracks. This means the record will be released next year instead of this fall or winter. "This is a temporary setback, though I'm not sure how long or short a period of time it will be. I've got the best doctors in the country looking after me and I will be singing and touring again as soon as I get the all clear. "Until then I'll be spending time writing and composing more music and kicking an empty soup can around the West Village." Strictly Come Dancing host Sir Bruce Forsyth is reunited with legendary singer Nat King Cole on his new album. An exhibition which gives an insight into the history of Australian rock band AC/DC has opened for the first time outside the group's home country. Pink Floyd star David Gilmour must pull down a beach hut at his listed £3 million seafront mansion or face prosecution. The Saturdays' Una Healy today announced she is expecting her first child with England rugby player Ben Foden.